God of War series director finds a new home with the makers of Ryse. God of War series director Todd Papy will be working on an unannounced project for Crysis and Ryse developer Crytek, according to his LinkedIn profile. Papy has been working on the series at the beginning, contributing God of War, God of War 2, God of War 3 in various positions. 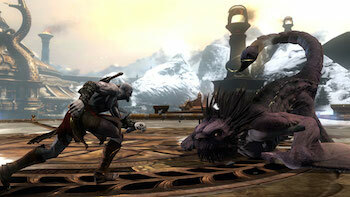 Papy last served as game director on God of War: Ascension. The new listing comes after Papy announced plans to leave Sony Computer Entertainment of America in early November. He had not disclosed plans to join another studio at that time. The profile lists Papy as "Game Director" at Crytek's studio in Frankfurt, Germany, with an added description; "Working on an unannounced project...more info coming in the future." When asked on Twitter whether his departure meant the end of the God of War series, Papy told fans; "Depends on what @SonySantaMonica wants to do with the franchise. I cherish my time with Kratos but needed a new adventure."